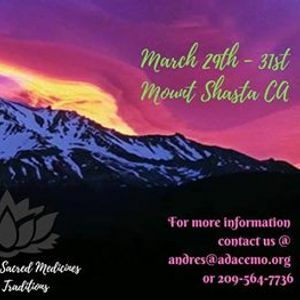 We want to invite you to this Sacred Medicine Celebration Ceremony taking place on March 29th to the 31st, in Northern California - Mount Shasta - The Ceremony includes 4 different medicine circles. 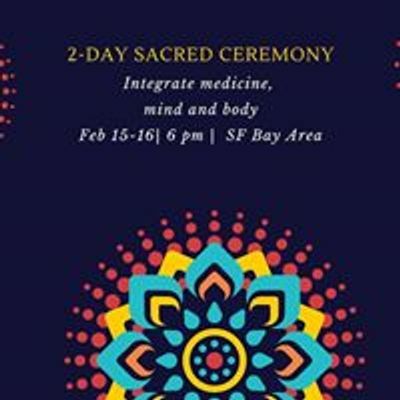 We ask for an Ayni (Sacred Reciprocity) of $550usd - 4 circles: 1 Sacred Mother (Aya-Huambisa-Bobinsana) medicine & 3 Different Sacred Father (Sapito, Niños Santos/psilo-huasca and Hapé) Medicines, We also will have Nadi-Chakra Yoga, Hindu-Shamanic Breathwork and a safe space for your processes. -Yoga sequence of specific Asanas to open the body's energy centers (Chakras) and for better energy flow. *The Medicines can show us that which is within us that needs to be healed and aligned (Patterns of though and behavior that are not serving us) but it wont do the work for you. This is not a fix-it ticket. Sacred Medicines are tools that contain a Live-essence/spirit that allow us to see and teaches us how to overcome the internal barriers in this life, Our life.. These ancient allies help us to initiate the process into knowing ourselves more deeply and with more clarity. 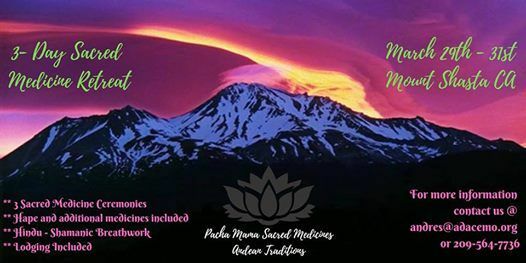 *This is an opportunity to answer the medicine calling: if you have been called by the medicines to South America before but cannot travel for extended periods of time due to time or money constraints. Follow your feelings, emotions and knowledge, if this Event speaks to you, You are more than welcome to join us! Who is the organizing party? Please contact us at YW5kcmVzIHwgYWRhY2VtbyAhIG9yZw== or call/text 209.564.7736 and we will answer all your Questions and give you the details of the event.